From Biogen Idec (J.Q.T., J.R., S.R., L.X., D.C.), Cambridge, MA; VU Medical Center (F.B., M.P.W., R.D. ), Amsterdam, the Netherlands; IMMUNOe (I.M. ), Centennial, CO; PAREXEL International (H.G. ), Glendale, CA; ALG Partners (K.B. ), Natick, MA; and Excel Scientific Solutions (E.P. ), Southport, CT. J.Z. is a former employee of Biogen Idec. 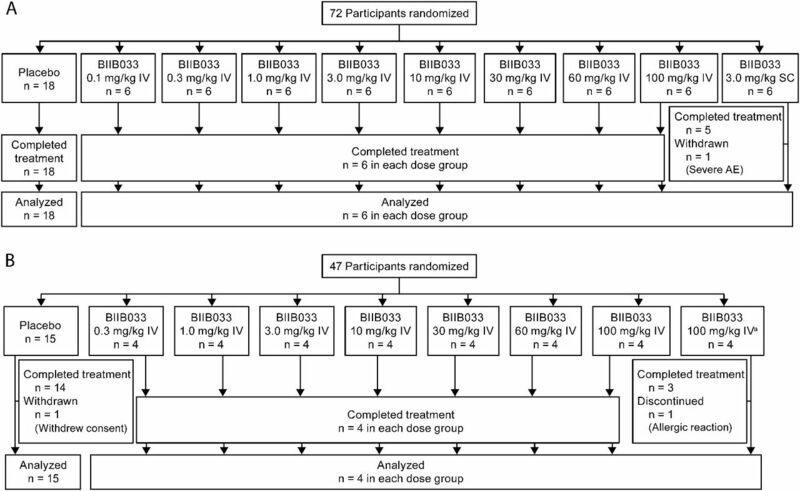 (A) Single ascending dose study and (B) multiple ascending dose study. Abbreviations: AE = adverse event; SC = subcutaneous. a 80-minute infusion time. (A) Single ascending dose study and (B) multiple ascending dose study. EC50 and EC90 values determined in rat lysolecithin-induced demyelination spinal cord model; values adjusted for 0.1% brain penetration. Abbreviations: EC50 and EC90 = 50% and 90% maximal effective concentrations; SC = subcutaneous.